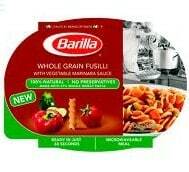 Click here to visit the Barilla site and fill out the form to request a free sample of a Barilla Whole Grain Vegetable Marinara Meal. You can also include a friends email to send it to them. Hurry though because this is only for the first 2,013 people.